Looking for a the perfect Thanksgiving card? 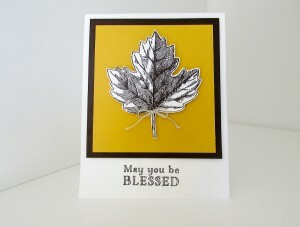 If so, here is a simple but elegant fall card I shared last November. I designed this card using the Stampin’ Up! Vintage Leaves Stamp Set and framelits. The sentiment is from the Me= Grateful Stamp Set. Cut a 3-7/8″ x 4-1/8″ piece of Early Espresso Cardstock layer it on top of your base. Cut a 3-1/2″ x 3-3/4″ piece of Crushed Curry Cardstock. 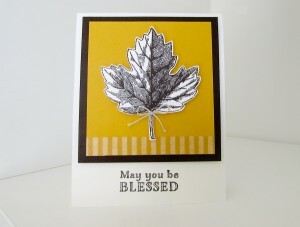 Use a Crushed Curry Stamp Pad and lightly stamp the Crushed Curry Cardstock with the stamp pad. You are using your firm foam pad to add the depth and design. Using a Cajun Craze Stamp Pad to stamp a few leaves around on top of the Crushed Curry Design. Layer your Designer Crushed Curry Cardstock to the top of your Early Espresso Cardstock. 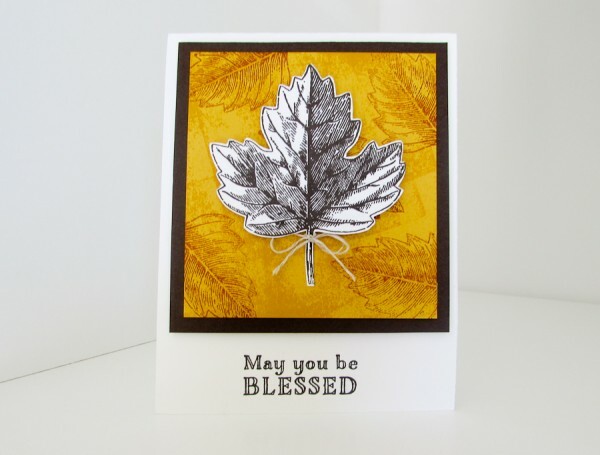 Stampin Up Vintage Leaf in Early Espresso and use the Leaflet Framelits Dies to cut it out. My sentiment was from the Stampin’ Up! Me = Grateful Stamp Set. I used an Early Espresso Marker to color the words I wanted and then stamped them. Vintage Leaf clean and simple design!